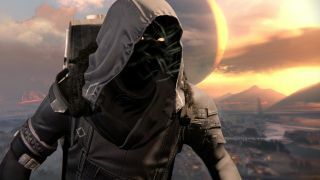 Destiny: Xur weapons, gear, and location, May 26 - 28. Hereafter, Monte Carlo, and Truth! Xur, Destiny’s travelling weekend Exotic trader, pulp horror novel cover artist, and famed liker of meringue, is back. This week he’s over in Tower, near the Speaker. Xur has a grim smirk under his hood today. He’s seen the Destiny 2 reveal demo, and he knows something the Speaker doesn’t. What’s good? Well there’s a pretty respectable line-up of solid stuff this week. The Titans’ Helm of Saint-14 is a great PvE exotic, particularly strong during Hive-based activities due to its ability to blind and confuse enemies who enter the user’s Ward of Dawn. It also has good buffs for super energy accrual and shield regeneration, so overall, a strong and interesting bit of kit for punching through those tight, swarm-packed choke-points. Warlocks do very well too, with The Ram. Constantly vying with the Obsidian Mind for the title of best Voidwalker helmet (personally I swing to the latter, but they’re both great), it adds the health-recovering Life Steal perk to all melee attacks. That’s powerful on its own, but getting the perk for free also opens up the scope for equipping Soul Rip (which boosts super energy on every special melee hit), and Embrace the Void (which part-recharges grenades with every grenade and super attack landed), letting you recharge pretty much everything at the same time, all the time. It also buffs your armour. It is a good helmet. The Hunters’ ATS/8 Arachnid is less impressive, alas. It just adds greater zoom to the Golden Gun super (not that important given the powerful target tracking already in play when firing that one up) and makes the window of opportunity longer. There are super and grenade energy boosts as well, but nothing exciting enough to make the Arachnid an easy sell. It’s better news in terms of guns though. Hereafter is a pretty handy sniper rifle, giving out increased zoom and steadier aim under fire when crouching. With hefty range, a high rate of fire, and respectable (if not top-tier) impact, it’s quietly become a bit of a PvP favourite. The fact that it refunds your mag if every bullet spent scores a precision kill is just delicious, buttery icing. Also, it makes a really cool noise when it fires, and frankly that’s half the battle. As for the Exotic / Ornament bundles, they’re both strong choices too. Monte Carlo is a really fun, really fast auto rifle that devours PvE enemies at medium range. It also increases your melee charge on every kill and has a random (but very high) chance of landing a full recharge when you drop an enemy too. If your build is anchored in melee abilities (like, say, my Sunsinger, who uses Scorch to trigger the Flame Shield perk), then it’s a hell of a powerful engine to plug in. And Truth is a bloody delightful rocket launcher, with near max blast radius, full-speed reload, and automatic target tracking. It is, to put it bluntly, a hoot. As ever, Xur will be around until 10am UK / 2am PT on Sunday, at which point he’ll be off for another week.